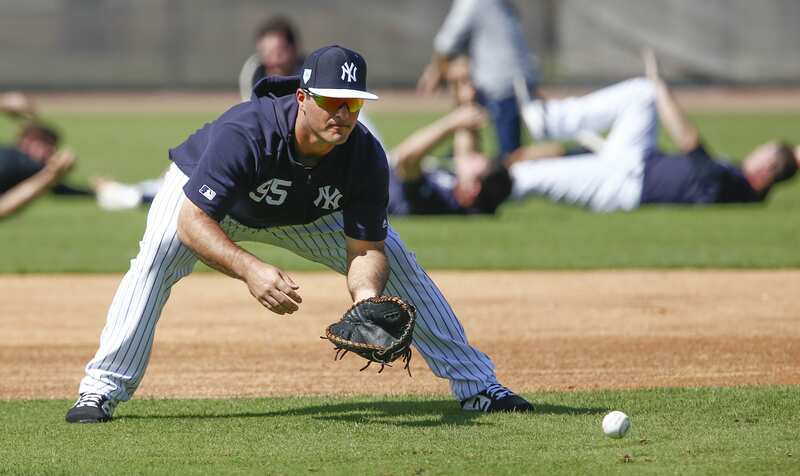 Home New York Yankees New York Yankees: First Base Competition Continues on Could Mike Ford Enter the Fray? Since Spring Training, the battle for first base has been a heady topic of conversation for New York Yankees fans. Luke Voit, whose numbers after the trade to the Yankees last season were stunning, had a good spring, as did Greg Bird, who had lost the job to Voit in the second half of the season. Voit’s Spring Training numbers were nice, .289 with a .943 OPS, four home runs in 17 games. Bird’s were better yet, hitting at a .333 clip with a 1.143 OPS, three home runs in 19 games. Bird is the better gloveman, though Voit had worked in the offseason to improve that part of his game and it showed in spring. Fast-forward to the regular season and fans are talking about Mike Ford, in the wake of slow starts for both Voit and Bird, Ford, the Yankees first baseman at Triple-A Scranton Wilkes-Barre, is getting noticed. Voit is currently sporting a .196 average with a .784 OPS and four home runs in 12 games, with Bird faring almost as poorly with a .214 average with a .674 OPS and one home run in eight games. Yankees fans are frustrated with the record number of injuries to the team and the struggles early in the season to score runs, hold leads and win games. None of which is Greg Bird’s fault, however, fans are calling for Bird’s head, as he’s been mostly manning first base while Voit fills in at DH in the absence of Stanton. The team has struggled to score runs and Bird and Voit’s lack of production has fans looking elsewhere for first base help. Mike Ford has been with the Yankees since he was signed as an undrafted free agent in 2013 out of Princeton. He had a stellar 2017 in Scranton Wilkes-Barre, with a league leading .410 on-base percentage. He posted OBPs of better than .400 in 2016 and 2017. Baseball America credits him with above-average power as well, and he tied for the system lead in home runs in 2017 with 20 between Double-A Trenton and Triple-A Scranton Wilkes-Barre. According to Baseball America, Ford has been one of the organization’s “most polished” hitters . In 2018, Ford had a solid campaign, but missed a month of the season with injuries. He managed to hit .251 with a .326 OBP and 16 home runs between Staten Island A (Short) and Triple-A Scranton Wilkes-Barre in 108 games. 2019 may be the coming out party for Ford in the organization, with Bird and Voit struggling at the plate, Ford is off to a torrid start for Triple-A Scranton Wilkes-Barre, hitting .423 with a 1.387 OPS and four home runs in the first six games of the season. The battle wages on for first base as the struggling Voit and Bird fail to lock down the job. Both Bird and Voit have options should the Yankees decide to send one or the other down. Ford is a left-hander, so he could replace the lefty bat of Bird in a righty dominated lineup. Such a shake-up may be just what the Yankees need to get the offense focused and productive.